Windshield wipers are a necessity for safe driving, but they don’t last forever. 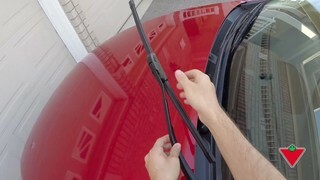 Changing your own windshield wiper is easier than you think! Don’t worry - you got this. Regularly check your wipers for dirt and grime. Wipe with a cloth and check for deformations. Windshield wiper blades are made specific to different vehicle models. Be sure to know the year, make and model of your vehicle before purchasing your new blades. Most vehicle models are made with a hook style of attachment. To remove your existing blades, find the tab located in the middle where the hook meets the blade. Simply press down on the tab until the lock disengages. Pull and release the old blade. To install the new blade, slide it around the hook until you hear a click, signifying that the blade has been locked in place. Some wipers may not be removed by tab or installed as shown, so make sure you read the instruction guide carefully before installing. Next, pull the wiper back down to place it on the windshield. Once you have done one side, you will need to repeat these steps on the other side. Don’t forget the rear windshield if your vehicle has a wiper on the back. Now, rain or shine, your wipers got your covered. Don’t worry – you got this.